Except for the day we flew to China, Tuesday was, as the title suggests, the longest day ever. Before I get to the details about our trip to Taizhou City, let me tell you how the rest of Monday panned out. When we first returned to the hotel after pickup, Maddie was quite upset. She kept crying out for her ayi (nanny) and saying, "Abu kay! Abu kay!" We knew "bu" meant no, but we weren't sure how the rest of it translated. When we asked our guide Kelly about it later, she said she thought it meant something like "I don't want to go." Whatever the exact translation, we knew Maddie really didn't want anything to do with us. Eventually, she tired herself out, and out of sheer exhaustion fell asleep on the bed with both of us. After a four hour nap, we all woke up feeling a bit better. She was no longer inconsolable, but we certainly couldn't get a smile out of her either. She ate a light dinner and then just sort of observed us both very soberly. We had a real breakthrough when we got her in the tub for a bath. I didn't think we'd even be able to get her clothes off because earlier when I had taken off one of her socks, she got very upset with me. Once she saw the water and the toys, she practically took off her own clothes. She spent about an hour in the tub laughing and playing and having a great time. Richard supervised mostly because she had really been rejecting him, so we had decided that Daddy would get to do really fun things with her like give her a bath and feed her m and ms. It seems to be working. We're on day three, and she is having eye contact with him and not pushing him away nearly as much as she did the first two days. Her first full night with us was great. She slept the entire night, starting out in her crib and ending up in our bed around 2:00 a.m. when she began whimpering a bit. She fell right back to sleep though and slept soundly until 6:30 a.m. Okay, so that brings us to Tuesday morning. We went to the breakfast buffet in the hotel and were pleased when Maddie ate well and even laughed and smiled for us a bit. At 8:40 we were in the car on our way to Civil Affairs to do the swearing in ceremony. It was sort of anticlimactic, but it did provide a nice photo op, and we received an official certificate and stuffed Panda. By about 9:30, were on the road to Taizhou City. After getting out of Hangzhou proper, we were presented with some very beautiful scenery. The area is fairly mountainous, and we drove by rice paddies and tea fields galore. It was a gorgeous drive, but long, four hours to be exact. After a quick lunch, we got to the Passport Office. It only takes three and a half hours, seven officials, three photo attempts, two orphanage directors, one translator, two parents, one child, and one special piece of paper with a very particular stamp to get a Chinese passport. 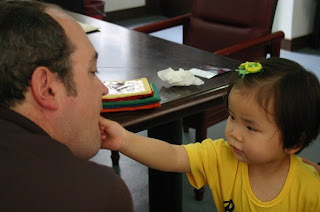 It was touch and go for awhile when Maddie's orphanage director hadn't brought THE piece of paper which didn't have the special stamp necessary. He had to return to the orphanage, get the paper, go to another office to get the stamp, and return to the Passport office. Finally, just before closing, everything was in order, and we were on our way. 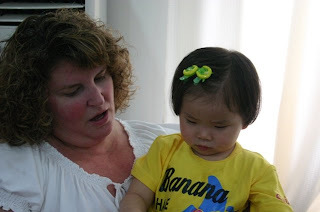 We did not have a chance to go to Maddie's orphanage because we ran out of time, but we are thankful that at least we got to visit her hometown, and we will have very fond memories of the time spent at the Passport office. Another four hour drive back, and we were back in our room by 10:00 p.m. Now you may be wondering how a newly adopted two and a half year old child dealt with this very long day. She was incredible. Not one tear. Not one bout of fussiness. She slept awhile on the way there and awhile on the way back. Oh, and it's important to note here that Miss Madeleine is completely potty trained. She will not go in her diaper. 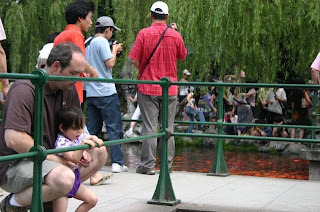 She says, "La shee shee," whenever she needs to go, and no amount of cajoling will convince her to go in her pants because as she told Kelly in Chinese, "No, no. Stinky." She has incredible control, but we did have to pull over on the road once so she could go. In three days, she hasn't had one accident. Tuesday night bathtime wasn't so fun because the poor little thing was beyond tired, but she slept in her crib all night long without a single peep until she awakened at 7:30 a.m.
Maddie is slow to wake up, but once she was alert, she was happy and smiling and laughing and playing. After another good breakfast, we headed over to West Lake which is one of the biggest attractions here in Hangzhou. It's 15 km around and just a beautiful area. We walked and watched boats go by, fed fish, saw peacocks, and really enjoyed a few hours outside. The weather was tolerable today, too. After a heavy rain last night, it was much cooler, and certainly quite pleasant by the lake. Next, we made a quick stop at the Silk Museum. Hangzhou is best known for the quality of its silk, said to be the best in China. I purchased a beautiful silk jacket for Maddie as a memento from her province. 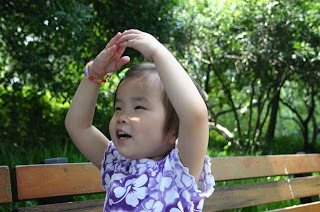 The other thing Hangzhou is known for is its tea which brings us to tomorrow's agenda, visiting a tea farm. As for the newest member of our family, we cannot believe our good fortune. Madeleine is smart and funny. She is a good eater and sleeper. As I mentioned before, she is potty trained and would much rather drink out of a real cup than a sippy. She gets around amazingly well despite her limb deficiency. In fact, she can climb up and down from the couch, "walk" from room to room, jump up and down, spin around. She already knows herself by the name Maddie, consistently calls us Mama and Baba and has learned a few English words, "Okay, beautiful, uh-oh, eat, silly" oh, and "no." We are simply having an amazing time and cannot believe the strides Maddie has made in such a short time. We miss Isabel enormously but cannot wait for her to meet her new sister. Looks like dad gets to write this post. 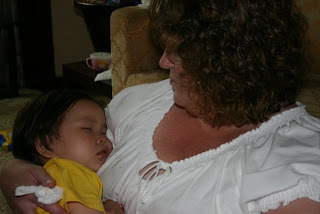 Mom currently has her hands full with a sad and tired little girl. We left this morning at 8:40am and arrived at an office building across town for the pickup meeting. I don't think either of us really thought too much as we went in, we just dove right in. 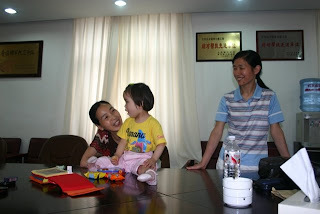 We walked up a flight of stairs, down a long hallway and into a conference room and there was Maddie (Qi Qi) with her two nannies and the orphanage director. They were playing and had the picture book Pam had sent open on the table. She knew who mama and papa were, but she was initially very wary of us. After making faces for a few minutes and breaking out the cheerios, we finally got her to open up after about an hour. We were all feeding each other cheerios until we ran out. Maddie would say Xie Xie Mama and Xie Xie Papa after each cheerio exchange, which is very cute. Maddie talks a lot but we don't know much about what she's saying so we're going to improvise. Meanwhile we did paperwork, took thumbprints and handed over a large wad of dough to the orphanage officials. At least we're no longer carrying all that cash. 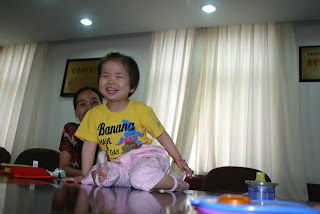 While Maddie was distracted, the orphanage director and her two nannies left while we were playing and she was still happy. She caught on as we were leaving and didn't initially cry until after we were in the car and back at the hotel room after a quick side trip for passport pictures. Since we've been back in the room we've been trying to keep her comforted and get her to take her noon nap. I think the next couple days will be a little rougH, but she seems to be calming down a bit after some more cheerios and milk. 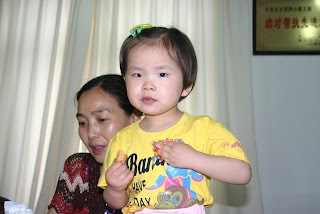 Tomorrow we go to Taizhou City to complete the adoption paperwork. We're down for eight hours of travel, but at least we get our wish to see her home city. This was a somewhat pleasant surprise as we didn't think we would get a chance to see Maddie's home town. We might even get to see her orphanage, however we're a little wary because if she sees her nannies, she may get sad all over again. We'll deal with it as things unfold. I think she's going to be fine and we're excited for her to meet Isabel as they seem to have similar temperaments. This post is being sent courtesy of Richards blackberry. Blogger is blocked, but to our surprise Sprint is not. We arrived in Guangzhou at 5:30 am Sunday China time after a relatively uneventful flight. After having the temperature guns pointed at our heads by hazmat specialists we were allowed to leave the plane. The Guangzhou airport is enormous and very cool. The worst part of the trip was waiting 4 hrs for our flight to Hangzhou. 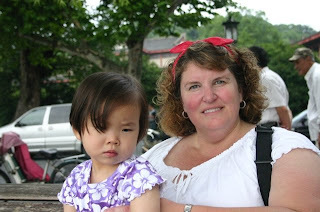 Upon landing in Hangzhou we were happy to see our guide Kelly waiting for us. She was smiling and waving a green Great Wall flag. 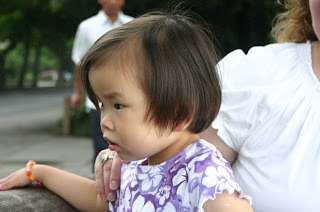 A 40 minute drive brought us to the Hangzhou hotel which Kelly described as old. The hotel is actually quite nice. We have a lovely 2 room suite and are close to many amenities including a bank, lots of shops and Papa Johns pizza which we had for dinner. 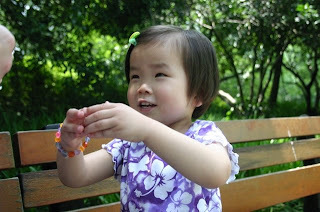 We pick up Maddie Monday at 9am which is Sunday evening in the US. The bags are all packed...well, except for Richard's. That doesn't surprise anyone, does it? We are all checked in for our flights. I think I have enough reading material to occupy myself for 16 plus hours. Let's get this show on the road! Here is our itinerary, so you can keep track of where we are and when. 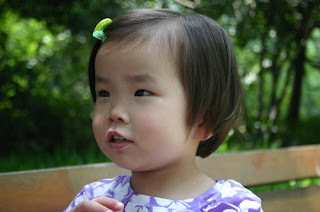 6.29.2009, 9:00 am: MEET MADELEINE! So this is probably it until we're on the other side of the world. Keep your fingers crossed that no one near us on the plane has a fever! We would prefer not to be quarantined! Well, Isabel is safely stowed away with my sister Patti in Wisconsin, and the house is strangely quiet. 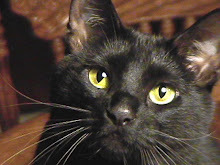 Even the cats keep walking around, bewildered at the lack of noise and activity. Other than the gaping hole in my chest, I'm doing fine. I miss her so much, but I know that this is the best course of action. Two weeks is, relatively speaking, a very short time, and the peace of mind I've achieved by making the decision to leave her home is invaluable. I'll be busy today, running last minute errands and packing and unpacking and repacking. One nice thing is that I will be able to accomplish a great deal in far less time than it usually takes when my little helper is here. In the end, I think this is better. Now Richard and I will have two solid weeks to focus our attention solely on Madeleine. I am hoping that we can make some small (or better yet large) strides toward bonding before we get home and rock everybody's world when the two girls meet. I've been so busy of late making arrangements and getting everything in order that I haven't taken a lot of time to ponder the fact that we will be meeting our new daughter in just a few short days. This morning, I've had a couple moments of pure joy and excitement as I think about that meeting. We will soon be a family of four. We will soon have the two daughters I've always dreamed about. And very soon, this quiet will be gone. I can't wait. On June 19, the US Department of State issued a travel warning to anyone going to China about the quarantine measures the Chinese government is imposing on anyone who lands in country with a fever or exhibiting H1N1 symptoms. It was this part of the warning that really caught our attention: In some instances, children have been separated from their parents because either the parent or the child tested positive for 2009-H1N1 and was placed in quarantine for treatment. 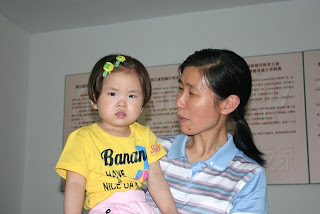 This situation presents the possibility of Chinese medical personnel administering medications to minors without first having consulted their parents. After much discussion and some last minute scrambling, we have decided that Isabel will not travel with us to China to pick up Madeleine. 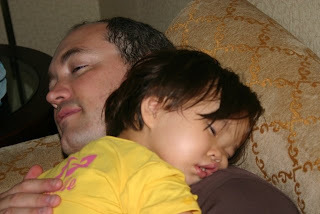 I am heartbroken for many reasons, but I cannot in good conscience take Isabel with us when there is even a remote possibility that she could contract H1N1 and be separated from us. I have never been away from Isabel for even one night, so I am going to miss her more than I can fathom, but my mind is at ease knowing that she will be safe and sound here at home. Many thanks to my dear sister Patti and her husband Bob who said yes without a moment's hesitation when I asked if they might be willing to take her while we are gone. So this trip seems very bittersweet at the moment. I am so happy to finally be traveling to get our Maddie. Not having Isabel there to be a part of it all is sad, but in my heart, I know it is the right thing to do at this time. Neither Richard nor I can believe it, but our baby has turned two. Where did the last year go? Considering we are leaving for China in five days, we kept the celebration fairly low key this year, but Isabel still had a great time. We began the celebration on Saturday with a breakfast date with Clifford the Big Red Dog. The Minnesota Children's Museum has a Clifford exhibit running throughout the summer, and about once a month, they are offering these quick meet and greets with Clifford himself. Let's just say Ibby is probably still a little too young to appreciate meeting a cartoon celebrity. She could tolerate him from a distance, but up close, she wanted nothing to do with him. She wouldn't shake his hand or say hello or even play peek-a-boo. In fact, in two face to face encounters, she started to cry. She was content to stand back and observe him with the other kids, and she was more than happy to say "bye bye" and wave when he retreated from the room. After breakfast, we spent a couple of hours exploring the museum. Miss Isabel had a ball running from exhibit to exhibit. I think she most enjoyed the grocery store and the bus. By this time, our continental breakfast had worn off, so we headed to Grandma Sandy's house for lunch and CAKE! Isabel loved the balloons and the cool Cheerio book from Grandma and Aunt Sue. Oh, and the cake wasn't too bad either. After a quiet afternoon at home and pizza for dinner, Isabel opened her card from Erin and gift from Aunt Pat, Uncle Bob, and Jake. Oh, and had a little more cake. There was a small meltdown right before bathtime which could have been caused by the overstimulation of the day or perhaps a bout of low blood sugar after all that cake was finally digested. Sunday, June 21, was her actual birthday. We began the day by taking Daddy out for breakfast since it also happened to be Father's Day. Then we came home, so Ibby could open the presents from Mom and Dad. Let me just say, Isabel thoroughly knows and understands the word "presents," and she enjoys them very much. So far it's a toss up between the xylophone and the Little People Busy Day House. Oh, one more thing. She got a real kick out of the Happy Birthday song. We sang it to her yesterday at lunch, and she just beamed from ear to ear. Daddy and I sang it to her this morning and then had to do two encore performances since she would laugh and clap her hands and say, "Again!" It was so much fun for us to see Isabel enjoy her birthday so much. We are so proud of our big girl. Happy Birthday, Isabel! Just this week, we had a small corner of the lot in the back of our home landscaped to accommodate a playset. The playset itself has been sitting in the garage (in Daddy's space) for the last three weeks. With the landscaping finished, it was time to set the sucker up. Neither Richard nor I was really looking forward to this task. We both came down with whatever Isabel had that made her projectile vomit earlier in the week, and we'd just come off of two days of almost complete paralysis and no food. We figured we were at about 85% capacity this morning, so we decided we better get her done. Besides, it won't be long before there are TWO toddlers to entertain around here. The more play possibilities, the better. 9:15 AM: Everything is out of the two gargantuan boxes and spread across our lawn as well as part of the neighbors'. 9:30 AM: Wow! It's already beginning to take shape, and it's only been 15 minutes. 9:50 AM: The walls start to go on and Isabel decides she loves it even in its unfinished state. 10:15 AM: A quick check of the instructions reveals the walls went on the wrong way...thank goodness we caught the mistake early on in the construction process. 11:45 AM: Bridge and tower proving a bit difficult to secure when someone keeps running back and forth across the bridge. 11:47 AM: Pose for Mommy! ...and TADAAAAAAAA! A new playset! Three hours. Not bad. And not a single argument! Oh, and just in case you thought all I was doing was playing photographer, here is evidence to show that I replanted several hostas while Daddy and Isabel did the building. Well, Daddy did the building while Ibby performed product testing. Despite the WHO declaration of a swine flu pandemic today, we received travel confirmation! It looks like we will be departing on June 26...two weeks from tomorrow...and returning on July 10. Our consulate appointment has been confirmed for July 8. I can't believe this is really happening! Isabel got one of her birthday presents early. You tell me. Do you think she likes it?